Some of you might recognize this truck from the 1953 Drag Racers film clip. This truck was called the Green Frog and was owned by Bill Waddill. Bill was a member of the Genesee Gear Grinders from Flint (President). The Green Frog was raced, but was primarily used as his push truck at the 1953 Drags for his '32 roadster called the Black Beauty. Bill won first in his class at the first sanctioned drag races in Livonia with the roadster. 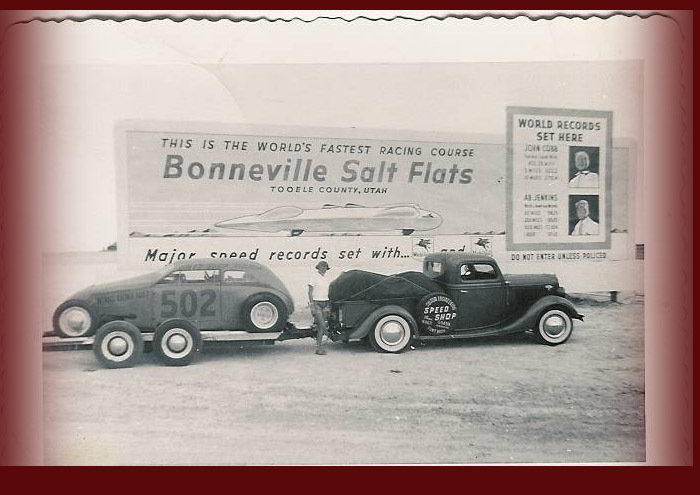 The photo below was taken at the Bonneville Salt Flats with his 1952 Crosley class record holder. This was sent in by Bills daughter. Thanks, Kathy!